ETPS℠ Neuromechancal Therapy is the world’s first integrative therapy developed exclusively to fight pain. The theoretical underpinnings of ETPS℠ therapy are based on sound medicine, firmly grounded in the concepts of acupuncture, modern neurology, microcurrent stimulation and myofascial release (muscular relaxation) techniques. ETPS℠’s unique contribution to pain relief comes from the synthesis of these different approaches, combining the therapeutic ‘pearls’ of these different therapies into easy-to-use protocols. By following the recommended protocols, physicians/therapists are able to identify anatomical areas most responsible for contributing to a patient’s pain condition. Areas deemed ineffective in producing positive therapeutic responses are eliminated from future treatments. Areas producing positive responses are examined diagnostically to determine interrelationship(s) with the patient’s condition and are integrated into future protocols. Using this approach, ETPS℠ can produce superior results over traditional pain therapy techniques in a fraction of the time. All without drugs, side effects, pads or gels. ETPS℠ has been a remarkable success in the fight against chronic pain. The results are so impressive using this approach, that complete or substantial relief from pain may often occur in the first or second treatment. Most patients require 2-10 treatments for permanent results, with some chronic patients requiring ongoing treatments in the home setting. ETPS℠ can be individualized to any patient’s needs and applied non-invasively in almost any setting, indoor or out, usually within 5-15 minutes. ETPS℠ stimulation is significantly more effective than any other therapies offered on the marketplace, decreasing recovery time by over 80%. For more information on how ETPS℠ can help you better manage and reduce your pain, contact our Acupuncture Physicians or purchase a session. ETPS℠ protocols bridge many different treatment philosophies to provide therapeutic responses where other modalities fail to achieve successful results. Because it is effective in the diagnosis of root causes of pain, ETPS℠ therapy can serve as an invaluable tool to all health professionals in their efforts to substantiate current treatment and as an integrative tool for current protocols. They are in supermarket scanners and compact disc players, and can shoot down satellites. They can measure the distance from the Earth to the moon within a millimeter and repair your vision with just one treatment. They can cut steel, produce three-dimensional images and transmit telephone messages around the world. What are they? Lasers. Theorized by Albert Einstein in 1917 and invented in 1960, lasers have proven to be a versatile high-tech solution to many of life’s problems. Today, more and more people are learning that therapeutic doses of laser light can also relieve pain and expedite healing for a wide range of health complaints. An increasing number of doctors nationwide are offering laser therapy to their patients. With its increasing popularity and use, that means more and more people are probably wondering about lasers in general and some important specifics, including how they work, how safe they are and what it feels like to get treated. To answer these questions and more, we interviewed Dr. Phil Harrington, a chiropractor who also has a degree in physics. Laser therapy is the application of low levels of laser light to areas of the body that have been injured or damaged. Contrasted with high-powered lasers used in health care that cut tissue, such as surgical or hair-removal lasers, therapy lasers produce beneficial photochemical and photobiological interactions that can help relieve pain and repair injured/damaged tissue. What is the history of laser therapy? The use of light as a healing modality has been recorded as early as 4,000 years ago in ancient Egypt. Albert Einstein wrote a theory about lasers in 1917, and the laser was invented in 1960. Laser light is special because it is monochromatic (one color), coherent (all waves are in phase with each other), and can be collimated (held to a small spot size at a great distance). Dr. Endre Mester was the first to observe the positive effects of laser when hair grew more quickly on shaved mice that were exposed to low levels of laser light. How long have lasers been used by health care providers? Therapy lasers have been used in Europe since Dr. Mester’s discovery in 1967. The U.S. Food and Drug Administration (FDA) gave market clearance to the first therapy laser in 2002. 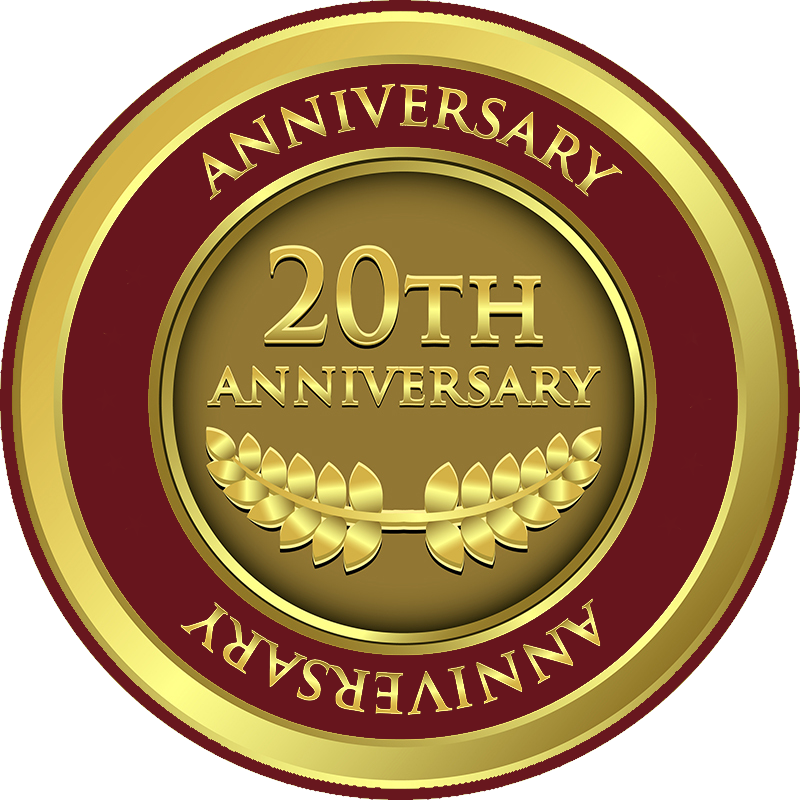 Since then, progressive chiropractors, osteopaths, medical doctors and other have been offering laser therapy to their patients in increasing numbers. The photons of laser light penetrate through your skin and are absorbed by special components in your body’s cells called chromophores. Just as photosynthesis creates energy for plants, the absorption of the photons by your cells causes increased production of cellular energy. In areas of injury or damage, this means there is more energy available to improve the rate and quality of healing. This is called biostimulation. Because of its biostimulatory nature, laser therapy has the potential to help any scenario whereby the body’s cells are not working to their optimum potential. Studies on tissue cultures reveal a wide range of beneficial physiological effects, including increased levels of endorphins, prostaglandins and other beneficial components; reduced levels of harmful compounds including C-reactive protein and interleukin-1; pain modulation through a variety of mechanisms; and increased rate and quality of tissue healing. OK, but what does that all mean in English? For patients, that means relief from acute and chronic pain, reduced inflammation and muscle spasms, improved range of motion and restored function. Patients suffering from headaches, neck pain, carpal tunnel, low back pain, sports injuries, post-surgical pain and more have been helped with laser therapy. Some patients notice improvement after the very first treatment session; with others it may take a few treatments. The effect of laser therapy is cumulative, meaning that each successive treatment builds on previous ones. The main benefit to patients, as reported by laser therapy practitioners across the country, is that chiropractic care plans that include laser therapy produce faster and better quality clinical outcomes. What does it feel like to get a treatment? With very low-powered therapy lasers, you feel nothing at all. Higher-powered (Class IV) therapy lasers produce a mild, soothing, warm feeling. You may notice a tingling sensation in the treatment area as blood vessels dilate, or that muscle spasms are reducing in strength and duration. Laser therapy is a painless treatment. How do you know it not causing cancer or other tissue damage? There are two ways that laser light can damage tissue; if it is very concentrated (high power density) or if the photons are very high energy. Therapy lasers use power densities that are far below the levels that cause tissue damage. Ultraviolet light has very high-energy photons capable of ionizing molecules, but therapy lasers use visible and near-infrared light, which only cause molecular vibrations. You could argue that therapy laser light is safer than sunlight. Some patients may experience soreness in the area of treatment, as toxins are released and blood flow is restored. World experts on laser therapy have commented that therapeutic lasers have no undesirable side effects in the hands of a reasonably qualified therapist. Laser therapy is safe, painless and inexpensive compared to alternatives. How do I prepare for a laser therapy treatment? Since laser light does not pass through clothing, laser therapy must be delivered directly to the skin. Wear clothing that can easily reveal the treatment area or you may need to change into a gown at your chiropractor’s office. Ask your doctor! A steadily growing number of health care practitioners are offering laser therapy to their patients. If your doctor does not offer laser therapy and believes it could help your condition, they should be able to refer you to a doctor who does. Learn how yoga, meditation, and breath work can improve and maintain brain health. The first class will focus on general brain health and yoga. The subsequent classes will target stress, memory, depression and anxiety, and insomnia. 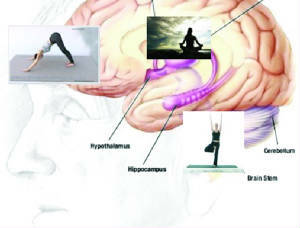 Learn how your yoga can keep your brain happy and healthy. Caring for both parents,one with Huntington’s and the other with Alzheimer’s. inspired Lisa to investigate the use of yogic practices for brain health. She has spent years researching varied types of yoga and meditation in relation to brain function. She teaches many specialized classes for people with special needs including Parkinson’s, Alzheimer’s, Huntington’s, TBI, MS and others. She has been a speaker at various information sessions, support groups, and fundraisers. Yoga is a living science – one that has evolved over thousands of years. The beauty of this ancient tradition is that it changes every time you come to your mat. The focus in this workshop will be to balance strength and flexibility in the low back and hips. We will work with techniques to alleviate low back compression and tightness in the hips. All levels welcome. Reduce stress and deepen your yoga practice in this relaxing guided workshop. Meditation techniques will be discussed and practiced. Join Sandi in this class to learn more about how to meditate. Let stillness blossom within you using the ancient technique of Pranayama (breath work) to quiet the mind as you ride the waves of flowing breath opening your body and improving overall wellness. Wear loose, comfortable clothes. All levels welcome. This is a monthly event and is scheduled close to the full moon. The Gong has all the sounds and vibrations of creation within it. It cancels out thoughts and allows you to completely relax very deeply and quickly. The mind is overcome and relaxed by the gong so that a very deep state of meditation can be reached. In this state, deep healing occurs and awareness is heightened. It is suitable for all levels of practitioners with no experience necessary. Wear loose, comfortable clothes. Discounts for class passes. This is a 4-week series designed for individuals who would like to release excess weight. Discover the tools to help you achieve the goal weight you have always wanted and desired. Reduce your appetite and look forward to exercising. Learn a simple yoga routine that you can do in the comfort of your own home. Learn how to talk to your body to achieve your desired results! Each class includes a 30 minute group hypnosis session for weight control and a CD to use at home. Prosperity is an inside job. We seek prosperity in every aspect of our lives including health, relationships, and money to name a few. Changing your feelings surrounding them can be attained through hypnosis because it can help remove resistance and blocks that are hindering your access to prosperity. This workshop shows how you can attain a mindset which will bring you to your greatest potential and live that wondrous life you deserve. Build a solid foundation of understanding and knowledge of the laws of attraction. Recent research has discovered that Hatha yoga helps alleviate the symptoms of fibromyalgia. Kathryn Curtis, of York University in Canada, studied the effects of yoga on women suffering from fibromyalgia. During this study, the levels of cortisol, a hormone linked to feelings of restedness, were measured in women doing 75 minutes of Hatha yoga per week. Researchers found that cortisol levels increased in women following this program for eight weeks. This led to increased alertness and mindfulness. Participants also indicated that they felt less pain and the associated symptoms from that chronic pain. Hatha yoga utilizes breath awareness and meditation, among other techniques, to create a relaxing, balancing experience for the practitioner. If you are a fibromyalgia patient looking to try Hatha yoga, we recommend the Hatha Yoga Blend class offered on Mondays and Wednesdays at 7 pm. Check the most recent class schedule for information and offers. 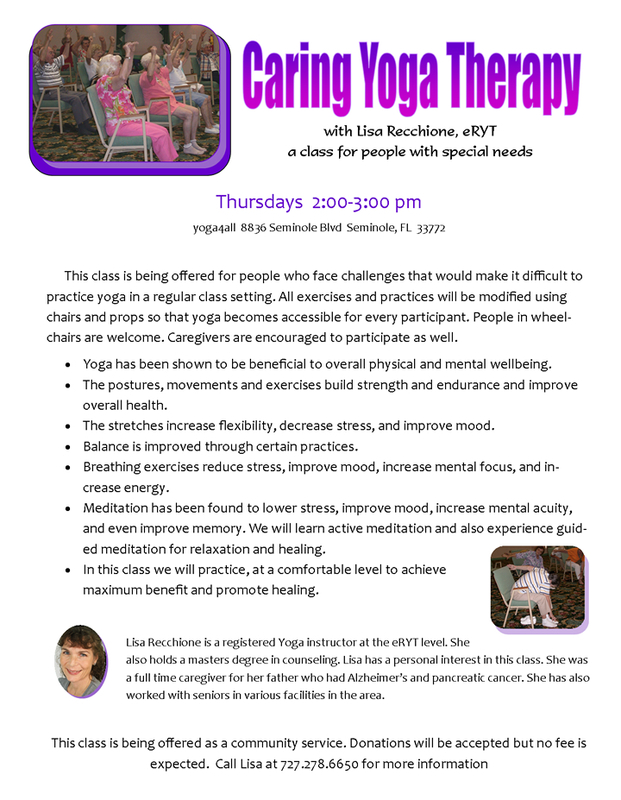 This class is being offered for people who face challenges that would make it difficult to practice yoga in a regular class setting. All exercises and practices will be modified using chairs and props so that yoga becomes accessible to every participant. People in wheelchairs are welcome. 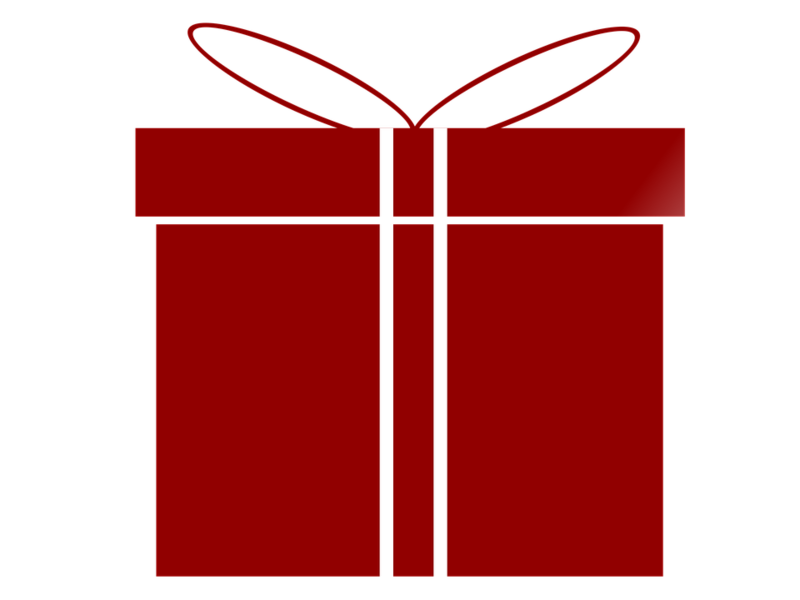 Caregivers are encouraged to participate as well. Yoga has been shown to be beneficial to overall physical and mental wellbeing. The postures, movements and exercises build strength and endurance and improve overall health. The stretches increase flexibility, decrease stress and improve mood. Balance is improved through certain practices. Breathing exercises reduce stress, improve mood, increase mental focus, and increase energy. Meditation has been found to lower stress, improve mood, increase mental acuity, and even improve memory. We will learn active meditation and also experience guided meditation for relaxing and healing. In this class, we will practice at a comfortable level to achieve maximum benefit and promote healing. Lisa Recchione is a Registered Yoga instructor at the eRYT level. She also holds a Masters degree in counseling. Lisa has a personal interest in this class. She was a full-time caregiver for her father, who had Alzheimer’s and pancreatic cancer. She has also worked with seniors in various facilities in the area. This class is being offered as a community service. Donations will be accepted by no fee is expected. Call Lisa at 727.278.6650 for more information.